One of the Seven Wonders of the World, needless to say, Taj is magnificently crafted. The interesting story that the hands of the craftsmen who built TajMahal were cut soon after it was completed fascinates me more.The precise marble cuts and the smoothness of the touch with the symmetry is awesome to see. Make sure you come here with your love, the feeling will be incomparable! Watching sunsets and sunrises with your love here is fabulous.’A teardrop on the cheek of time’, described Rabindranath Tagore. Taj is not the only beauty to appreciate. The charm of the city expands to numerous monuments, palaces and forts in the city.Agra Fort and FatehpurSikri, are two of the UNESCO recognized World Heritage Sites. BulandDarwaza is another admirable Mughal piece in Agra. Come to the ‘City of Victory’ and you will feel the Mughal Era is back. A series of spectacular palaces, holy mosques and public buildings, this place is a busy and beautiful. Also, Moti Masjid, the Marble Mosque, Diwan-i-Aam and Diwan-i-Khass, SheesMahal are some beautiful places in FatehpurSikri. Considering you have been to Jama Masjid in Delhi, visiting Agra’s Jama Masjid can be interesting for you. If you are an admirer of forts, palaces and Akbar the Great; Agraawaits you. You must go on a heritage walk in Agra. Hold your girlfriends hand and walk across the beautiful Mughal Gardens, sit and gaze the sun. The gardens are enchanting and romantic. Every garden has its own story, rather than just being a part of Mughal Era; each garden has a love story to share. Ram Bagh, MehtabBagh, SoamiBaghSamadh are few of the beautiful gardens in Agra. Yes, Agra in rich in culture and heritage; but while admiring the beauty don’t miss on shopping. The city has several popular markets to buy some traditional clothes, jewelry, handicrafts, stones and much more. In fact, the marble-made handicrafts and stone works are the souvenirs from Agra. Do buy a TajMahal for your love, and if you haven’t found one you can still buy a small TajMahal to show it to your love in future 😉 Be romantic! The cloth pieces of Zardosi, attractive carpets, and dhurries,itar, leather made items and brassware from the city is popular. The markets are so busy that some time you won’t find space to walk, but the shops are so attractive that you will eventually make to your shop! 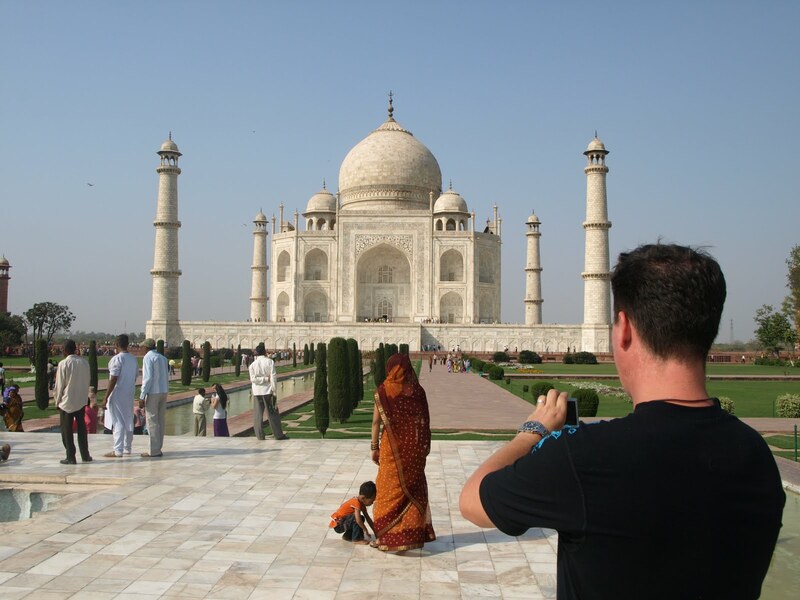 A few tips for you weekend Agra trip: Carry your camera, Budget: Rs. 3,000 per person (inclusive of 2 nights stay in a 3-star hotel) and visiting this place with friends or partner is suggested. PS: Book your Delhi to Agra Taxi with AHATaxis, for a comfortable and safe ride. Previous Post Want to enjoy your Himachal Trip? Hire a Taxi!